The human lung is divided into two parts, the respiratory zone and the conducting zone. The conducting zone contains the trachea, the bronchi, the bronchioles and the terminal bronchioles. These are the first 16 to 17 generations. The gas-exchanging part, which consists of the respiratory bronchioles, the alveolar ducts, and the alveoles are the last 6 to 7 generations. On one hand, the conducting zone conducts the air to the respiratory zone, on the other hand, it warms, cleans and humidifies the breathed air. The airways are supported by a skeleton, which is getting smaller from generation to generation. From the bronchioles on, there is no skeleton anymore. As the generations and therefor the bifurcations increase, the cross-sectional area increases from about 2-3cm² to 150-200cm² in the terminal bronchioles. At the 16th generation, the bronchial epithel becomes alveolar epithel, this area is called azinus. Every terminal bronchiole opens up in about 200 spherical alveoles. The alveoles are surrounded by a razor-thin membrane wall (approx. 1µm), which transport oxygen-poor blood. The alveoles are about 0.1mm thick. Both lung lobes together contain ca. 300 million alveoles. This way, the contact surface enlarges to 80-120m². Some pictures of the segmented lung geometry can be found here. 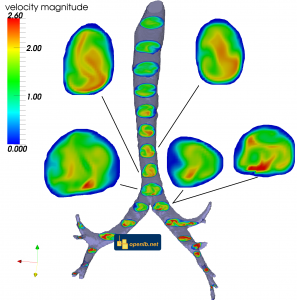 Simulations of the airflow in the upper part of the human lungs has been perfomed using OpenLB. Contributed by Mathias J. Krause and Thomas Gengenbach.